Would you risk booking your family in a ‘beautiful resort villa’ in another country if you didn’t first see the pictures of the resort? Of course not. Pictures matter. They matter a lot! So if you’re going to use pictures in your own listing, make sure they are good. Remember, you’re competing not only against other properties but also against large hotel brands, so you really need to make a good impression. Get gorgeous! 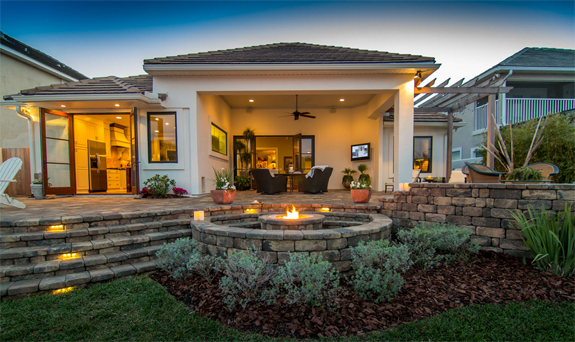 Great photographs of your Florida vacation home help sell a feeling as well as showing the feature of the home. Photo courtesy of Trevor Ward Photography. Oh. You’re not a professional photographer? That’s ok. Here are 10 tips courtesy of professional architectural and interior design photographer, Trevor Ward, to help you get started taking gorgeous professional results from your own camera. Part 1 covers staging, composition and lighting. Watch out for more tips in Part 2 on equipment and editing. PREPARE the area to be photographed. This includes cleaning, organizing and staging. I’ve seen photos with un-vacuumed carpets, wrinkled curtains, overgrown grass, or cluttered kitchen counters. For Pete’s sake, preparation doesn’t cost anything except a few minutes of your time. Clean and dust surfaces. De-clutter counters. Straighten furniture. Sweep pathways and pool decks. Mow the lawn. STAGE each scene in your photos to make it visually appealing. For example, if you’re taking a photo of a dining area, set the table with plates, glasses and utensils. Add some flowers or lit candles. A bottle of wine (or even champagne) adds a touch of class. Sit back and enjoy the view. Even just the illusion of drinking wine could help your customers buy from you! Photo courtesy of Trevor Ward Photography. ACCESSORIZE – When it comes to interior decorating and staging, you need to strike a balance between having too many props and none at all. No props make a house look vacant or abandoned. Too many props look tacky and can make a photo look too busy. Trying browsing the web if you need further inspiration with regards to staging or composition. Check out houzz.com for some interior design ideas plus an advice section. FOLLOW good composition rules. First, use the landscape mode and shoot with the camera sideways. There is a reason why most professional photos and ALL TV and movies are in landscape mode (widescreen). The science behind it is beyond the scope of this article but it has to do with the way we naturally see the world. FIND interesting angles. Sometimes getting on a ladder or getting on your knees will give you an interesting perspective that really helps you sell the image. SHOOT either on 45s or 90s. 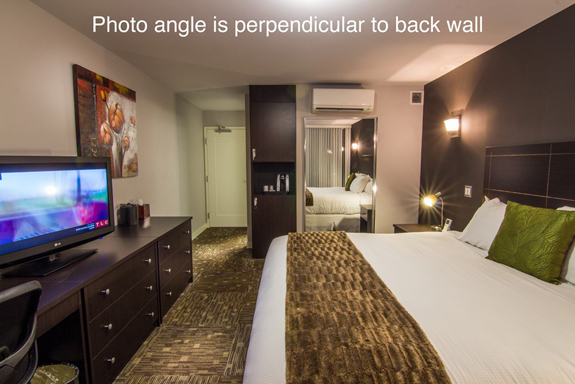 This refers to having the camera pointed at 45 or 90 degree angles to your subject. With tight spaces like bathrooms, this may be difficult. But with living rooms, kitchens and exteriors try to think in these terms. Wes Anderson’s The Grand Budapest Hotel or Moonrise Kingdom are excellent examples from the film world. GET wide or stay tight. Wide shots that show the whole room give us perspective. Tight shots provide us with close ups of featured details such as fine woodwork and upgraded fixtures. Make sure your image is well lit. This may seem obvious. What may NOT be obvious is exactly how to do that. NO FLASHING. My first suggestion would be to turn OFF the flash. I BEG YOU. It’s great for weddings and birthday parties, but not so much for architectural and design photography. TURN IT ON. 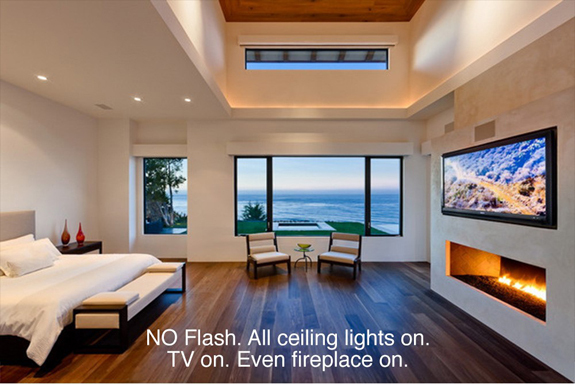 Next, turn on any lighting fixtures that would be visible in the picture, even if it’s during the middle of the day. This helps makes a place look inhabited and welcoming. The same goes for exterior shots. Turn on any lights that might be visible from the outside: porch lights, bedroom lights, etc. Even on a sunny day, those small lights give the subtle impression that the home is lived in and inviting. TAKE A WEATHER CHECK. One note about clouds. Contrary to what you might think, clouds are good for photography. Direct sunlight can be nice on your subject, but can also create very harsh, dark shadows. The contrast between the shaded areas and directly lit areas can be difficult for cameras to capture. When the clouds cover the sun, it softens the shadows and makes them less harsh and also reduces the contrast between shaded and unshaded areas. If you don’t have clouds, try to shoot with your subject either all the way in the shade or all the way in the sun. Now watch out for Part 2 of this article which will cover some inexpensive equipment for your smart phone that will help you take better pictures and I’ll also explain why you should ALWAYS edit your photos before uploading them. If all this sounds like too much work, you can, of course, hire a professional who specializes in architectural photography. And for just a few dollars, you can have peace of mind knowing that your photos will be perfect. Trevor Ward is a professional architectural and interior design photographer in Orlando, Florida, USA. You can view some of his work at www.trevorwardphotography.com. He’s currently offering vacation home owners registered with Direct Villas Florida discounted rates starting from US $300 for one home (maximum size 2500 sq. ft with no cleaning and minimal staging) or two houses from $500. You can contact Trevor via his website, www.trevorwardphotography.com or by email at trevor@redeyefilmco.com. Remember to quote your Direct Villas listing ID when contacting him. 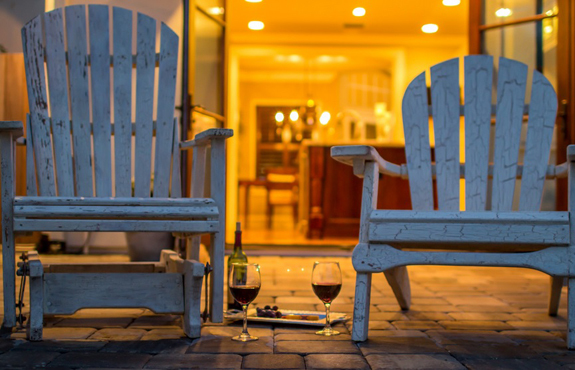 Whether you book the professional services of Trevor Ward Photography or follow his top tips then don’t forget to get your gorgeous new images uploaded to your Direct Villas Florida listing as soon as possible. NOT YET REGISTERED with Direct Villas Florida? If you’d like to advertise your own home on www.directvillasflorida.com our listing package is available for just £120 per year. Contact info@directvillasuk.com or call Sarah or Tracy on +44 (0)333 2400 797 for more information. This entry was posted on Friday, March 20th, 2015 at 9:00 am	and is filed under Blogroll, Florida villa owners, Marketing your Florida villa, Uncategorized. You can follow any responses to this entry through the RSS 2.0 feed. You can leave a response, or trackback from your own site.